Windows 7 Upgrade - How will you go for it? Articles, Experiences, Troubleshooting and Errors. Do you have a PC loaded with Windows Vista Home Premium or one of the business editions? Then you can get an upgrade to Windows 7 for your PC for a very reasonable price. In fact, in some cases, the Windows 7 upgrade can even be free of cost. However, everything depends on fulfillment of certain conditions, which can vary between retailers. I have a PC with Vista Ultimate Edition installed. Will I get a free upgrade to Windows 7? That is hard to say. You will have to talk to your retailer about the options for a free Windows 7 upgrade. There are indeed some editions of Vista Ultimate that qualify for a free upgrade. However, not all retailers are eligible for providing this service. In some cases, if you purchased a branded PC with Windows Vista preinstalled, then you may be eligible for a free upgrade to an OEM version of Windows 7. In other cases, if you were supplied with an installation disc for Windows Vista, that may be replaced with a disc of Windows 7. Ask your retailer for options. My retailer's name is not on the Microsoft Windows7 upgrade pages. What Should I do? If you do not find your retailer's name as a participant in the Windows upgrade offer pages, don't worry. Many additional retailers are now participating in the offer. All of them may not have their names listed on the Microsoft website. Ask your retailer for clarifications. If I get a Win 7 upgrade, will it have a validity period? If you get an OEM version installed in your PC by the manufacturer or retailer, then you should ask them about the duration for which the OS will remain activated. However, if you have been supplied with an installation disc for Windows 7, then it is for you to keep. What do you think about Windows 7 Upgrade? 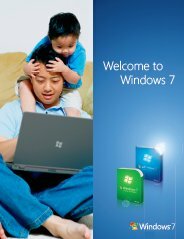 Do you have any Windows 7 Upgrade experiences, ideas, article, story, opinions, errors, problems and tips which you would like to share? Why not take a few moments and Share it with everyone!